After eating brisket for three straight Rosh Hashanah meals, I am ready for something different. There’s nothing wrong with brisket for the holidays, in fact I absolutely love it, but I am ready to experience a family tradition that isn’t necessarily my own. Enter Casa Luca. This new Italian restaurant in DC embraces the family traditions of chef/owner Fabio Trabocchi and his wife Maria. The restaurant is designed to capture the “Italian spirit of conviviality around a communal table.” Everything down to the name has a down home feeling. In fact, “Casa” means home in Italian, and “Luca” is the name of the Trabocchi’s 9-year-old son. Trabocchi is also chef/owner of Fiola, which in a relatively short time (it opened in April 2011) has become one of DC’s finest Italian restaurants. I am charmed by the ambiance of Casa Luca, particularly the touches that look effortless but clearly are not. This includes ceilings lamps with linen shades bearing the restaurant’s name, and matching linens adorning a nearby wall. The design may very well have come from some family member’s kitchen. Oversized black and white photographs on the wall are vintage family photos. Adorable. 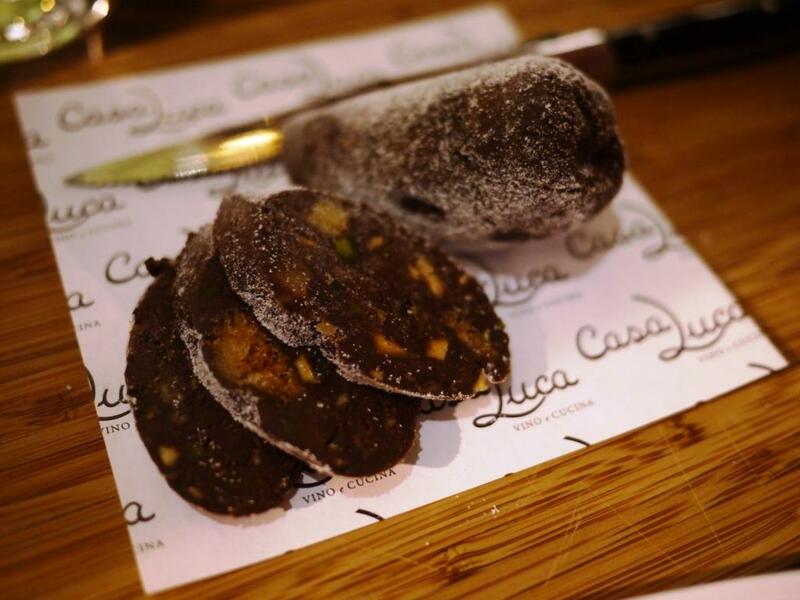 The cooking at Casa Luca is Italian rustic, and many of the dishes are based on old family recipes. To keep the tradition all in the family, Trabocchi’s son Luca is bound to be in the kitchen on most nights, plating desserts or giving restaurant advice to his parents. 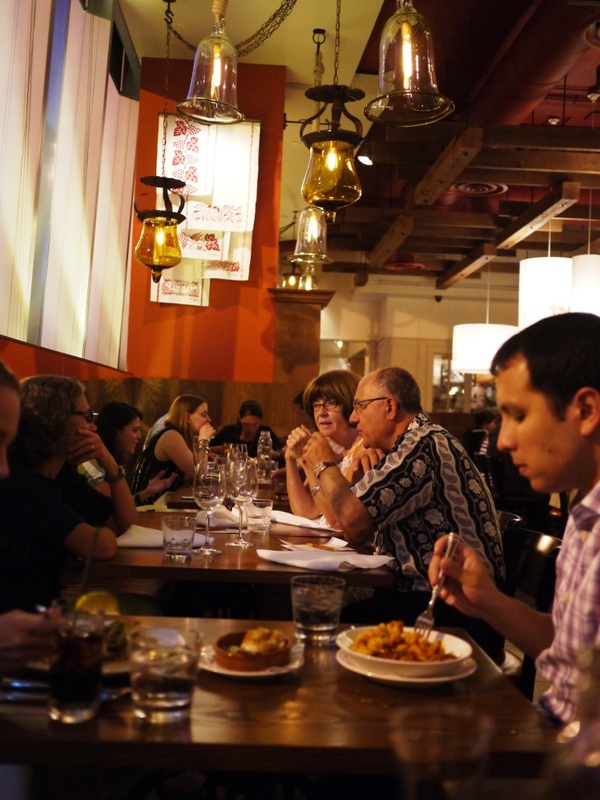 Maria Trabocchi, who stops by our table to chat, tells us that she spends her time bouncing back back and forth between Casa Luca and Fiola, and planning for their next venture, Fiola Mare in Georgetown. She flits about the restaurant, making guests feel comfortable and at home. My husband and I order a half-carafe of on-tap Donna Laura Super Tuscan Merlot/Sangiovese blend, and reminisce about our trip to Italy two years ago. Casa Luca doesn’t have to try too hard to evoke fond memories of that vacation. As we sip our wine, we wonder why more restaurants don’t offer a half-carafe option. I’m always left wanting a touch more than one glass of wine, but can never finish a full second glass. Much of the food at Casa Luca was originally imagined in Chef Trabocchi’s home region of Marche in Central Italy. 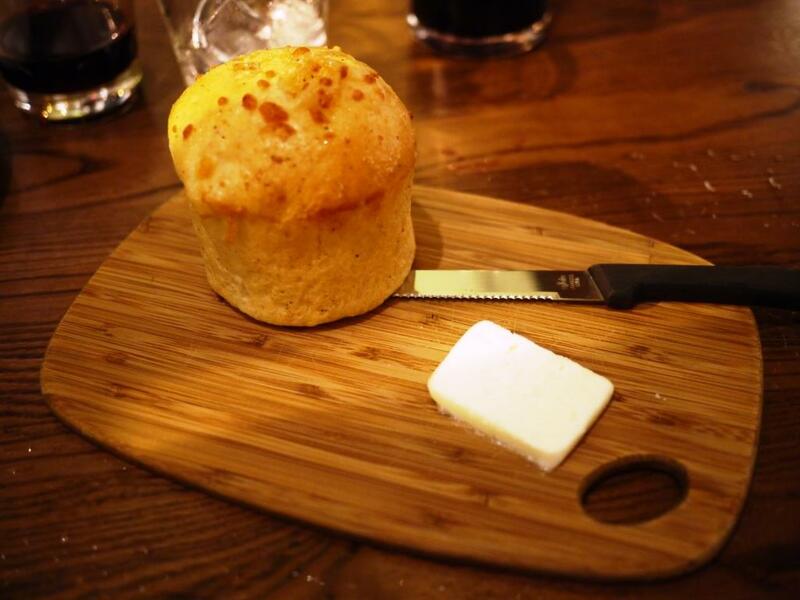 This includes pani delle marche, a cheese bread accompanied by a soft slab of buffalo butter. The brioche-like bread has a perfect balance of bread to cheese, which for me means the cheese is not overly gooey or overpowering. Sharing dishes is encouraged at Casa Luca. Happily, this is not small plates dish splitting. It’s the kind of sharing you do at a family meal, where you just lean over and take some food off another person’s plate. For once my husband and I are simpatico about what and how much food to order. 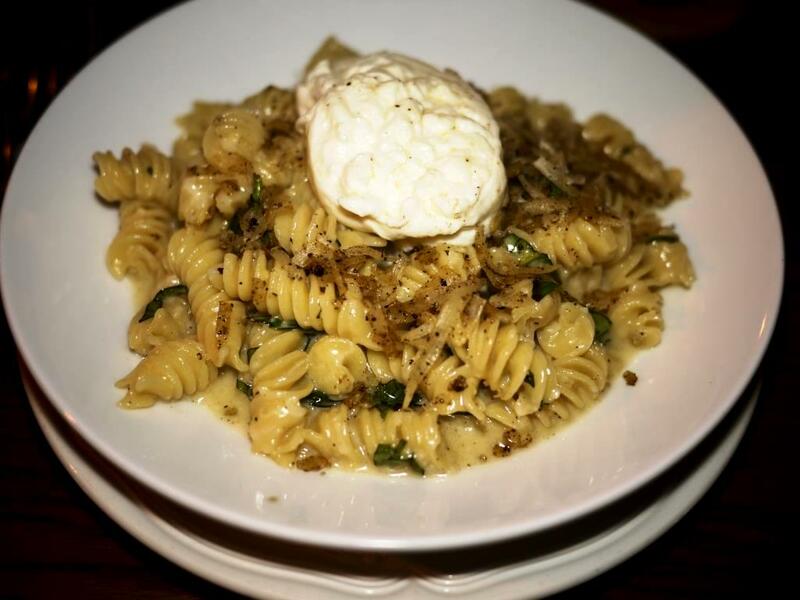 Fusilli with sheep’s milk Cacio Cheese, black peppercorns, burrata, and basil is simple perfection. Everything comes together just the way it should- the texture of the pasta, the smoothness of the burrata, and the fresh aromatic basil. It’s a lovely dish, and one that I could envision ordering on a return visit. 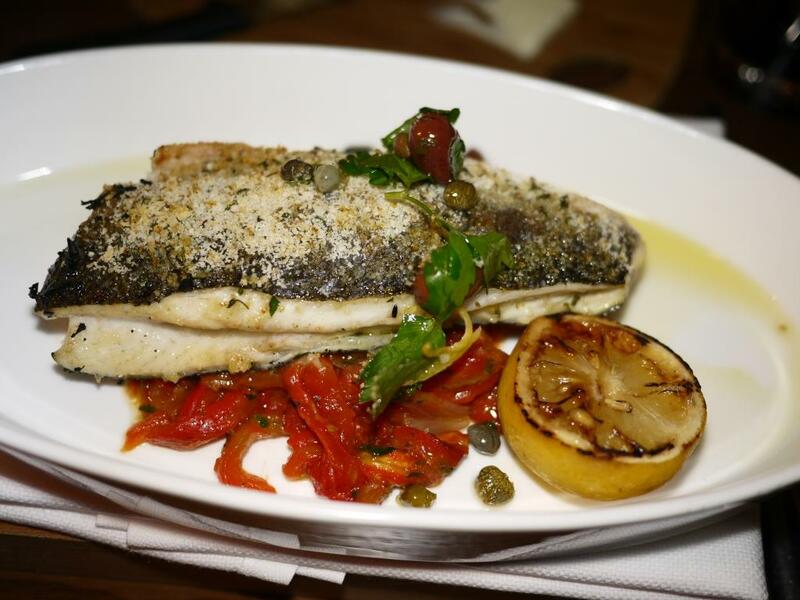 Branzino al forno with red peppers, tomatoes, olives, and basil doesn’t need any further adornments, but the salsa verde on the side adds another layer of flavor. The fish is perfectly cooked, and my husband declares it the best branzino he has ever had. High praise indeed, as he eats a fair amount of branzino. The sole disappointment is roasted cauliflower with raisins and pine nuts. I don’t discern any raisins in the dish, and it’s rimmed with a little too much oil. There is a great deal of cauliflower competition these days at area restaurants, and to me this one doesn’t stand out. We order a trio of gelati and sorbet for dessert. The server comes back with two dishes so that we can taste all six flavors, along with a complimentary order of Salame al Cioccolato Marchigiano, which looks deceptively like salami but is a rich chocolate studded with nuts. 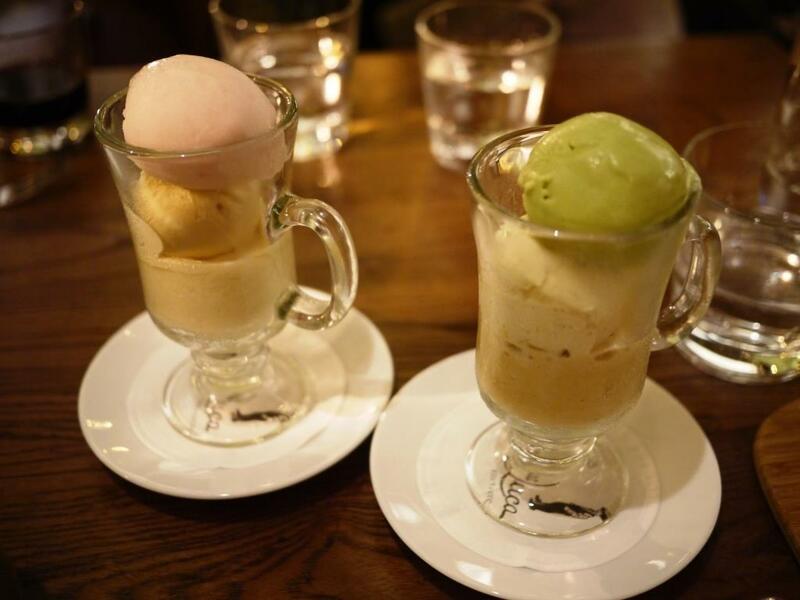 The terrific gelati includes flavors of caramel, burnt honey, and pistachio, along with peach and pear sorbet. I prefer my frozen desserts to be served in an oblong dish so the flavors don’t all melt together. I dig deep for the burnt honey gelati, tucked in to the bottom of the dish. We complete our experience with steaming hot cups of Illy espresso, another fond memory from our Italian vacation. I am guessing there are one of three reasons for the extra servings of dessert: 1) we’ve patronized Fiola a few times 2) we are gushing to our server about the quality of the food or 3) I outed myself by tweeting early on in the meal. I really, really should not do this, as it likely does affect our experience. As far as I can tell looking around the room at the diners surrounding us, the service seems to be uniformly expert. 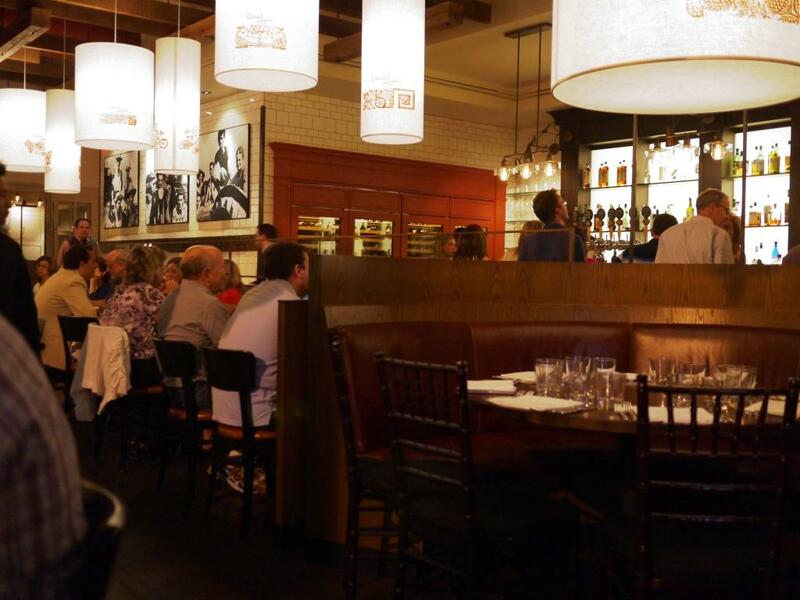 Casa Luca is a restaurant that succeeds in honoring family traditions and offering quality cooking reminiscent of the old country. It’s the perfect transition from a round of Rosh Hashanah meals made special by the company of our own friends and family.